Get ready to watch some serious puddle jumping before your very eyes! 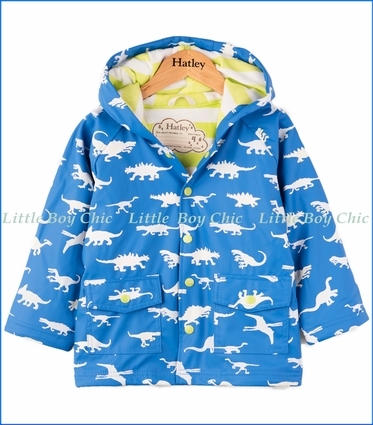 This dinosaur print raincoat is not only adorable, but fully lined and guaranteed to keep your little guy dry no matter what Mother Nature has in store. Print changes colours in the rain! PVC-free and waterproof. Fully lined. Front snap closure. Inside hanging loop. Front patch pockets.